Searching for an affordable whole house filtration system that makes your drinking water safe from waterborne contaminants and particles? The Pentek 20" Big Blue Filter Housing & WS20BB Filter System delivers high-flow and heavy-sediment large capacity filtration applications. 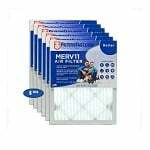 Instead of spending more money to purchase individual parts for your whole house filter system, we offer this reasonably priced Pentek 20" Big Blue Complete Filter System for only $199.99! That's an unbelievable savings of $126.45 off of the manufacturer's suggested retail price of $326.44. 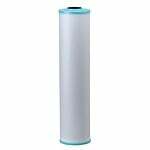 This complete 20" Pentek Filter System is also known as part number 160363. 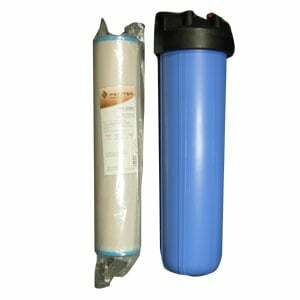 The extra large house offers greater cartridge capacity to accommodate the Pentek 4 1⁄2" x 20" WS-20BB Water Softening Resin Filter. The WS-20BB filter is manufactured with FDA grade softener resin that allows optimal contact between the water and resin surfaces to ensure maximum ion exchange. The internal expansion pad of this Pentek resin filter minimizes channeling, while the post filter eliminates any potential for bypass. 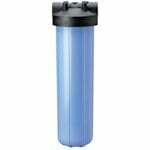 Dimensions: 23 3⁄8" x 7 1⁄4"
The 20" Pentek Big Blue Filter Housing is compatible with a wide range of chemicals. The extra large filter housing reduces the number of vessels required for high flow rate applications. Do not use this system where the water quality is unknown or is micro-biologically unsafe for drinking water applications, without proper disinfection before or after the system. To prevent filter fractures and water leakage, be sure to protect your unit against freezing.